Hope is not lost for those that just would like a bowl full of rich and creamy spaghetti and meatballs…but without meat, wheat, gluten, dairy, soy or legumes and that actually contains protein and is good for you. And of course tastes not good, but great. I may sound like a Californian, but despite my dietary restrictions (as a creative endeavor), I am a displaced New Yorker. Good Italian food, that does not cost an arm and a leg, is not as easy to find in LA as it is in NYC. Rather than eat an affordable meal of so-so pasta, I decided to create a classic dish that satisfied my craving, my family, and was fresh, with a ton of veggies and that met all my current dietary limitations. And as an added bonus, that contained components that could be stored in the freezer (storability is an important factor in my family as there is often a need for last minute meals). 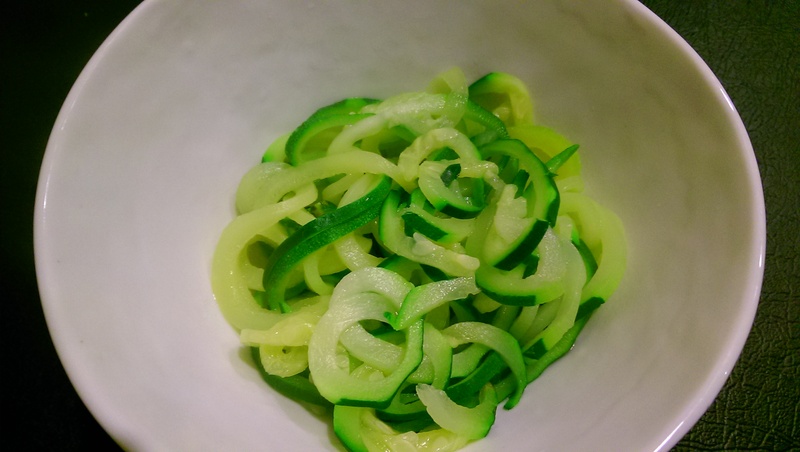 Zucchini noodles – or zoodles – have changed my life. 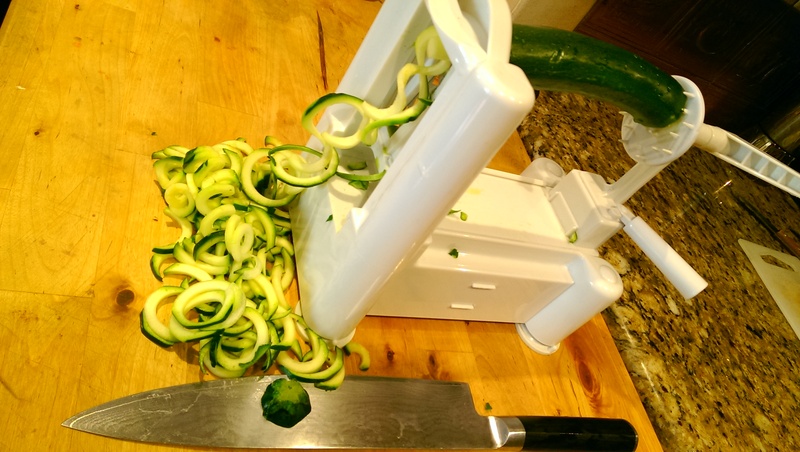 I have said this before, and I will say it again – invest in a spiralizer or a mandolin (or both) to make noodles out of vegetables. Save the consumption of pasta for when you can get your hands on the real deal – perfectly cooked hand made pasta in which you savor each bite. Pasta itself, for the most part, does not have much flavor so it can be easily replaced in simple dishes. 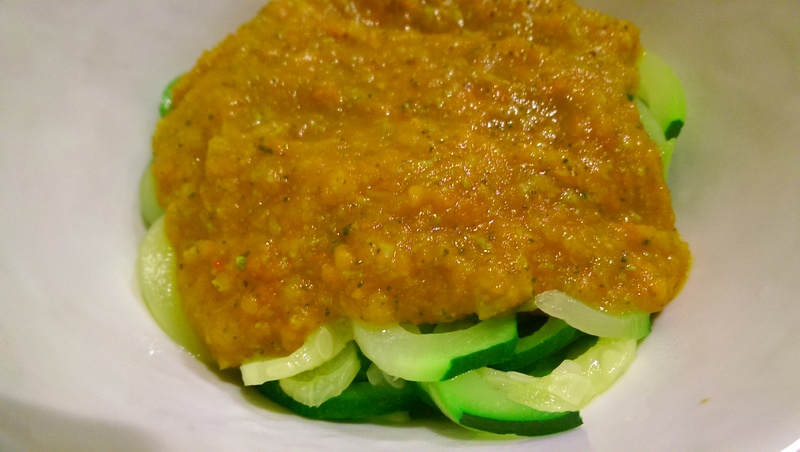 Zucchini makes great noodles and lasagna sheets, as do sweet potato, root and other veg. Zoodlesonly take about 3-5 minutes to cook in boiling water and then I save the water to cook other dishes. 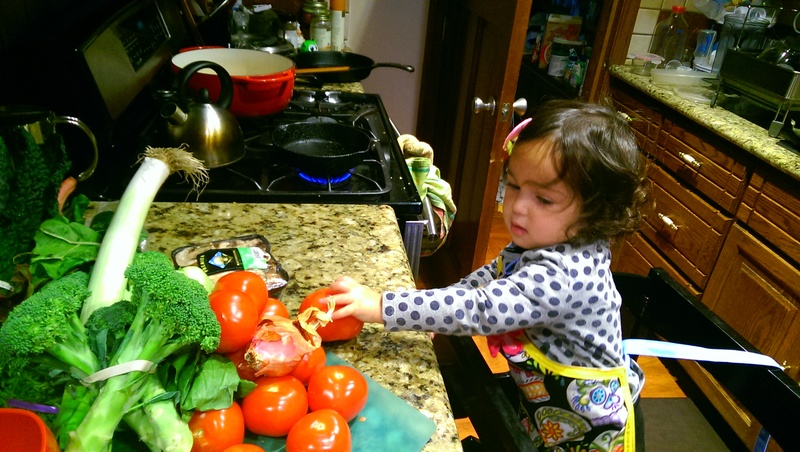 Sauce is so easy to make fresh and a great way to incorporate a lot of vegetable into your diet (especially for the little ones). 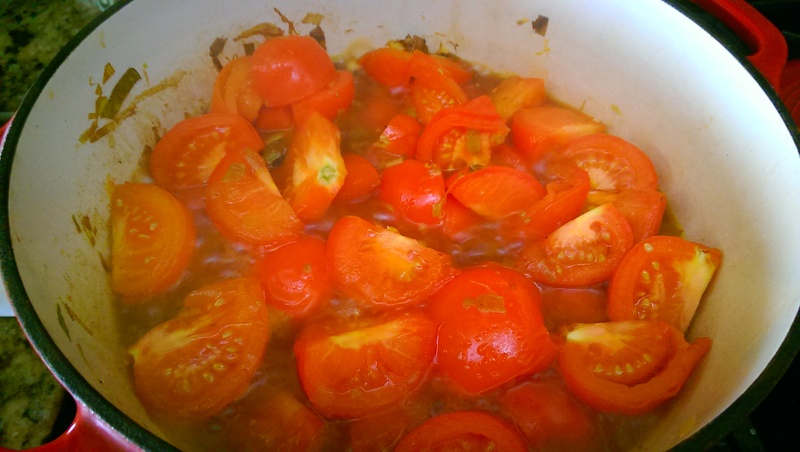 Depending on my need or mood, I will make the sauce chunky or puree it so that it looks like just a plain tomato sauce. It was once believed that sauces took a long time to make and needed to be cooked for hours – but actually full flavor can be achieved in 20-45 minutes. Tomatoes are acidic by nature and the longer they cook, the more acidic they can taste as the mass is broken down and the liquid cooked off, concentrating the acid. I cook a lot with onions, so I decided to change it up with leeks. Leeks are part of the allium vegetables and therefore cousins to garlic and onions. While nutritionally they are similar, they offer a variety in the diet. I like them in soups, tarts and sauces because the flavor is sweeter and more delicate – you won’t be knocked out with onion flavor. But they do require a much longer cook time than onions. Once the tomatoes are cooked with stock and have broken down, I throw in a bunch of other veggies – carrots, broccoli florets and stems (when you remove the tough exterior of the stem, the inside flesh is soft and sweet), leafy greens, mushrooms, zucchini and cook until soft before pureeing. I wanted to give the sauce a robust and creamy flavor so I blended it with coconut milk (from a can) which is quite neutral in flavor. I store my homemade sauce in ziplock bags in the freezer for up to three months. I also eat the sauce chunky without the coconut. Spaghetti and sauce on it’s own are great, but I wanted this to be a balanced meal with protein. What I really craved was a meatball. 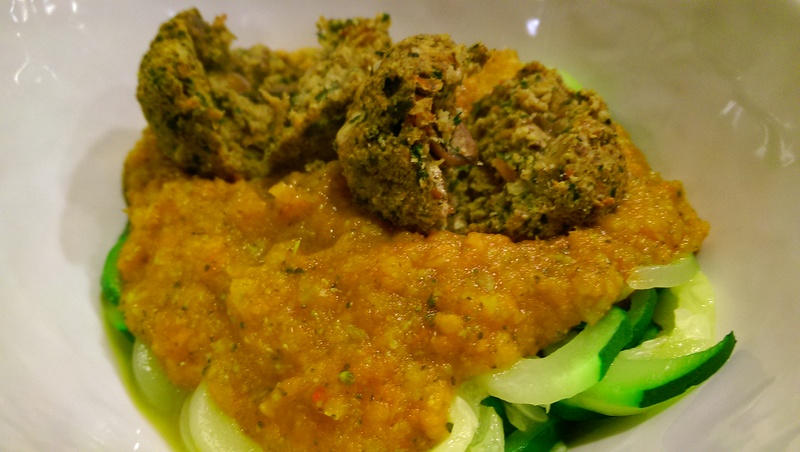 Typically vegetarian meatballs are soy based or are dry. 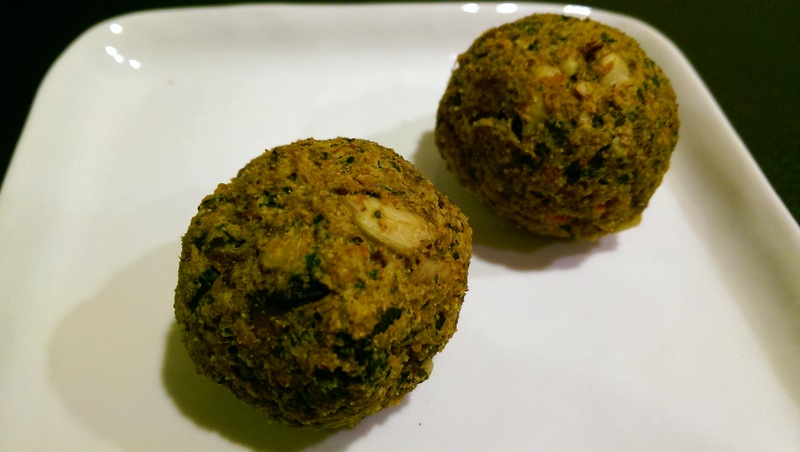 I set out to create a faux-meatball that was firm but moist, rich in protein and flavor. 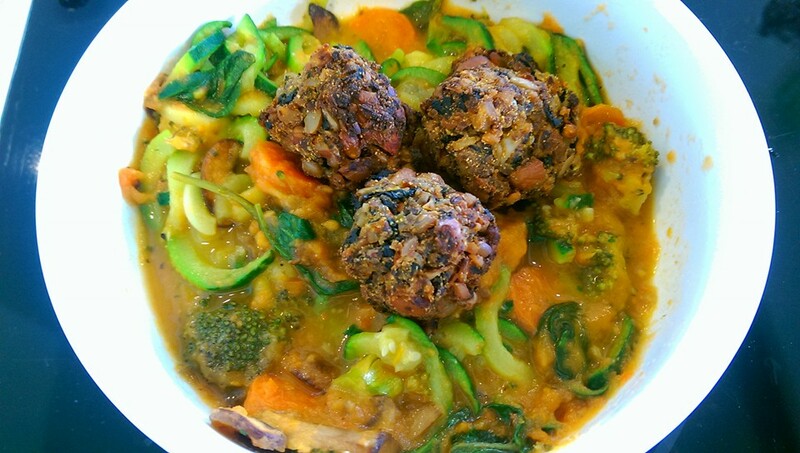 I managed to create a robustly flavorful meatball out of a nuts, sunflower seeds, arrow root powder and veggies. 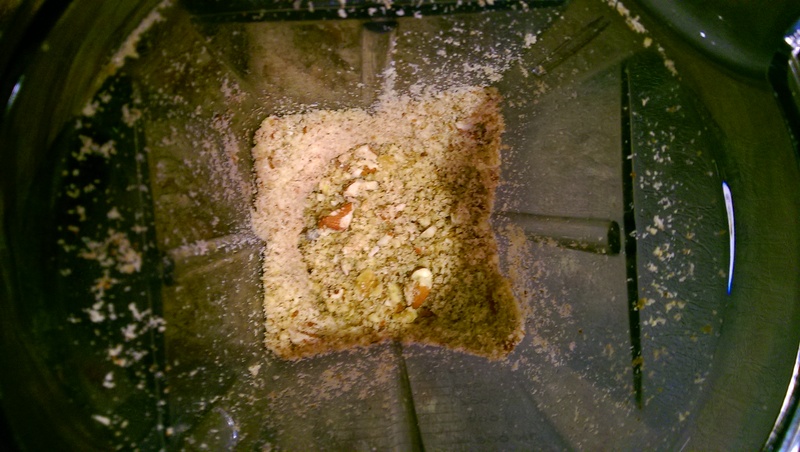 I used my vitamix and a dry container to grind the almonds and cashews into a coarse flour. You can always use store bought almond and nut flours but I find the fresh ground ones offer most flavor, texture, moistness and I think probably retain more nutritional value (as processing, light and heat destroy vitamins, etc over time). If using a store bought flour, you may need to adjust the moisture with more egg or water. When all ingredients are combined, the mixture should be sticky enough to stand on it’s own and to be rolled into small balls. I used egg as a binder since we eat eggs, but I have made these using flaxseed as an egg replacer and it is fine but note that it adds more moisture to the mixture, so adjust as needed. The key to the flavor is mushrooms – they add an earthy flavor and body to the dish (along with nutrients). I also added sunflower seeds as an additional source of protein for the body and texture for a pleasurable eating experience (never forget texture and color when creating meals). 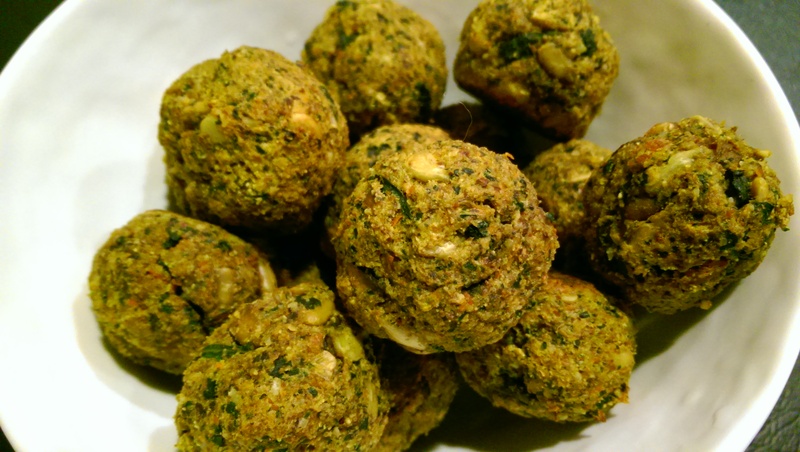 I baked these faux-meat or nutballs in the oven until they were crisp on the outside and soft and moist on the inside – about 25 min at 400 degrees F. The balls can be frozen in the freezer either before baking or after for up to three months. I did not find a difference in moistness after freezing by either method. They were the perfect addition to the sauce. It was a robust, flavorful and satisfying bowl of spaghetti and meatballs. 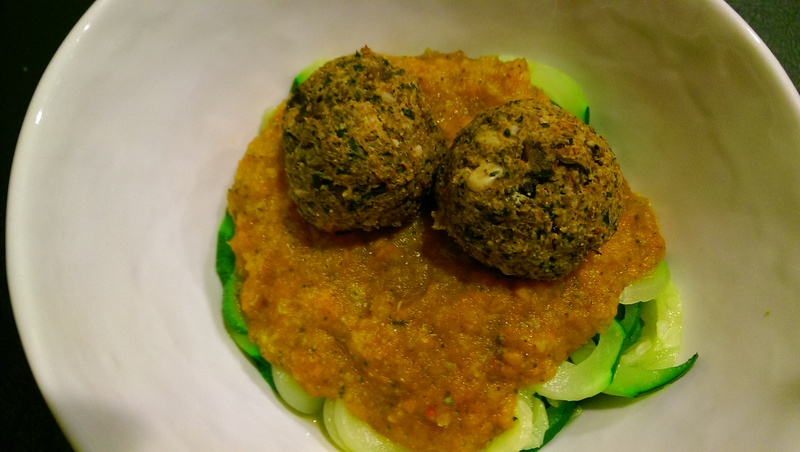 I wish I had take a picture, but the next day I placed these non-meat nutballs in a lettuce wrap with some sauce and cashew nut cheese. I highly suggest playing with these balls. Add 1Tbs ghee to a pot on medium heat and add fennel seed and cook for about 1 min, add leeks and stir. Cook leeks stirring frequently until browned – about 15 min. Add in mushrooms, and cook until browned – about 5-7 min. Add in chopped tomato and veggie stock. Cover and stir every so often, and continue to cook until tomatoes broken down and begins to look like a chunky sauce (about 20 min). Add in veggies, cayenne and oregano, stir, cover and cook until veggies are tender – about 10 minutes. Add garlic and cook for 1-2 min. Remove from heat. 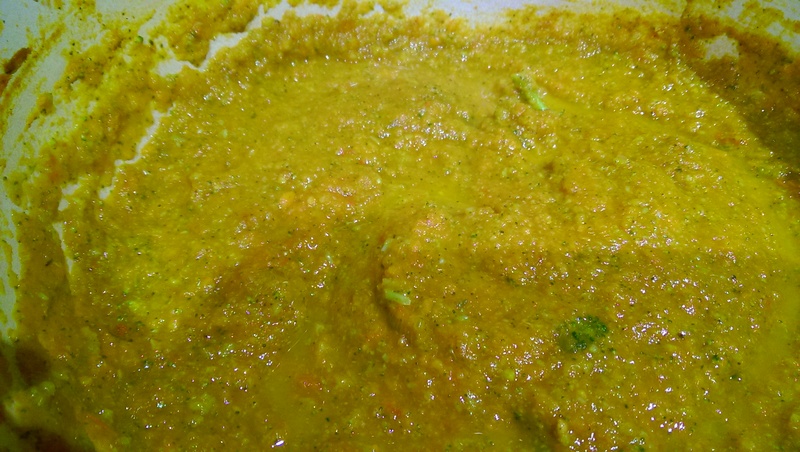 The sauce can be left chunky or pureed (in a food processor or with a hand blender). Add in coconut milk (optional) and puree. Add salt and pepper to taste. Preheat oven to 400 degrees F. Add 1-2 Tbs ghee to a pot over a medium flame and add onions. Cook for 5-7 min until translucent, stirring every so often. Add mushrooms and cook for another 5-7 min until juices have come out and mushrooms are browned. Add garlic, and stir for about 2 min, then add carrots, kale and veggie stock, stir thoroughly, cover and cook for about 10 min until veggies are soft and the liquid is mostly cooked off. Remove from heat. Blend the mixture with a hand blended or a food processor and place into a bowl. Add in the egg and mix together. In a separate bowl, mix together walnut, almond and coconut flours with arrowroot powder and oregano. Whisk together. Add in sunflower seeds and mix in, then add the dry ingredients to the wet mixture and mix together – by hand is best. Once it is fully blended, add salt/pepper to taste. The mixture should be sticky enough to hold together and form small balls about 1.5-2 inches in diameter. Roll out balls by hand and place onto a lined, greased baking sheet. Bake for about 20-25 minutes until crisp and golden brown on the outside, but still moist and tender on the inside. ← It’s not cheating. We were on a break!